The University of Belize officially launched its Transformational Plan 2022 on May 24th, 2018 at the Radisson Fort George Hotel. This is a proud moment for the University which has taken a step in transforming itself to become a more student centered institution, more efficient in what it does and reaching out to young Belizeans to get a quality education in many more disciplines. “The University of Belize must be a student centered institution and it is not only about the quality education they will get but also the friendships that they will create and the experiences gained. The best times in our lives were at the University.” The transformational plan will be implemented within the next five years. Universities today are businesses some that are driven for profit and some that are not for profit like UB but driven to also ensure that they run themselves in an efficient manner. The Deputy Prime Minister, Hon. Patrick Faber congratulated the University and is enthusiastic to be a part of the change. He advised that he was looking forward to the day when UB will rise to the level it has now proposed and thus supports the efforts of the University. He once again advised the University to become efficient at what it does, was pleased to see the move towards Institutional Accreditation and would look to providing a larger subvention for the University. 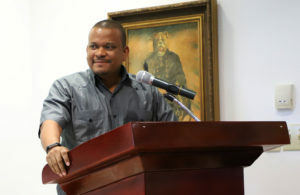 He noted that students at UB were paying some of the lowest tuition in Belize and the Caribbean. As part of its Transformational Plan the University of Belize will be seeking institutional accreditation by the year 2022. The accreditation launch was facilitated by Dr. Carlise Wynne, Professor at the University of North Georgia (UNG) and Dr. Chaudron Gille, Associate Provost, UNG. They presented on the value of accreditation, the types of accreditation and the different regional and international accrediting bodies. They then went over the standards required for accreditation including candidacy, documentation and quality assurance and requirements. A launch was held on May 7, 2018 where Board Members, Senior Managers, Directors, Deans, Chairs and representatives of students, faculty and staff were present. Professor Emeritus Clement Sankat encouraged the participants to seize the opportunity to take this University forward. “Its attainment will not only enhance our respectability in this national, regional and global community of Universities in which we operate, but most importantly the mobility and transfer of credits of our graduates – to graduate school for example; the employability of our graduates and the potential of our graduates for enhanced financial support; the licensing process for graduates from our professional programs and very importantly our ability to attract prospective students not only from Belize, but from the Caribbean and Central America and the world over,” expounded President Sankat. Mr. Deryck Satchwell, member of the Board of Trustees, encouraged the UB team to not see accreditation as meeting a checklist of standards but developing a culture of quality. Chairman of the Board of Trustees Mr. Harrison Pilgrim congratulated the leadership team of the University for their hard work in advancing the University and assured those present of the support from the Board.